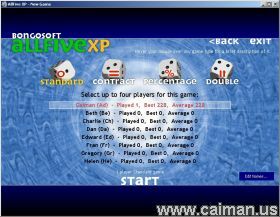 Caiman free games: AllFive XP by Bongosoft (Tim Wakeling). AllFive Xp is much much more than a computer version of the dice game Yahtzee. 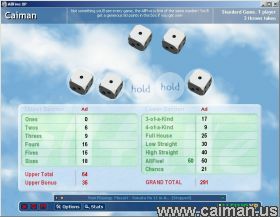 It`s older brother, AllFive 2000 --->http://www.caiman.us/scripts/fw/f113.html, though very good lacks many new features which are found only on AllFive XP. Variety of midi songs built in. You just can`t get a better computer Yahtzee game at any price! Download the AllFive XP User Guide 570 KB. AllFive XP - Common Problems .